Twice in the past four months he has found the creatures slithering around in the backyard of his home in East Jakarta, most recently on New Year's Eve when he discovered a 1.5 meter-long (five foot) venomous cobra. "I was so startled," said Arifuddin, 49, adding that he never saw snakes when he first moved in several years ago. Snake encounters in the Indonesian capital are becoming more commonplace for several reasons, experts say. Natural habitats are dwindling as Indonesia urbanizes, while poor trash disposal in the sprawling city of 9.5 million means snakes and people are finding themselves in closer contact than ever before. Men like Freddy Hanggoro are all too familiar with snakes inside a home or workplace. He's a member of the Sioux Snake Rescue, a community of snake enthusiasts that finds itself handling a growing number of calls from residents unnerved by encounters with snakes. He says he gets a call at least once every few days. A python found on the street at Halim, Jakarta causes a traffic jam on 8 December, 2016. In 2017, the 150-member volunteer group said it had rescued more than 130 snakes from people's homes. The year before, the group caught around 90. Recently, he and a friend traveled 20 kilometers, snake hook in tow, to a factory in Bekasi, West Java -- a suburban city on the outskirts of Jakarta. After sweeping the factory floor they found a venomous cobra coiled in one corner. He put the snake in a small fabric bag made of soft, porous material and tied it. "We release it somewhere far away from the populated area, to prevent another conflict in the future," he said. "It can be dangerous if a person mishandles the snake," he added. He adds that it's particularly common to find snakes during the monsoon between November and March, when heavy rains cause floods that wash snakes out from their hiding places. The biggest snake the group has caught was a six-meter (20-foot) python in the Kembangan area of West Jakarta in 2016. It was hidden in the ceiling of a house. Sioux Snake Rescue came about in 2009 as an offshoot of the Sioux Snake Indonesia foundation, which was founded by Aji Rachmat six years earlier with the initial intention of educating people about snakes. In Indonesian cities such as Jakarta, it's common to find people leaving garbage right outside their homes, especially in low-income areas, Rachmat said. And the piled-up garbage attracts rats and mice, staple food for snakes such as cobras and pythons. "If their food can be found around people's homes, that's where they go," he explained. "It's all related, because in the end it's all about the food chain," said Rachmat. According to the Ministry of Environment and Forestry, Indonesia loses around 684,000 hectares of forest area every year. This is mainly caused by illegal logging, forest fires from improper palm oil production practices and forest conversions for new palm oil plantations. A team from Sioux Snake Rescue catches a snake in Jakarta. Amir Hamidi, the head of the herpetology division at Indonesia's Institute of Science, a government research agency, says some snake species such as pythons are highly adaptive and can live both in the forest and in the city. Hamidi warned that snakes will continue to show up in people's homes unless Jakarta residents stop discarding their waste in areas they're not supposed to. In the last month, Hamidi said there were multiple reports of python sightings around Jakarta and West Java. 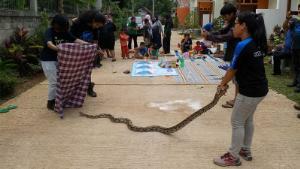 A 2.5-metre snake was found in Cibinong, while another one was caught on a main road in Bogor. In April, a four-meter python emerged from a sewer in Pasar Minggu, a densely populated area of South Jakarta. Suparno, a fireman at the South Jakarta Fire and Rescue Department, told CNN his team often captures snakes in houses or off the streets of Jakarta, although he cannot be sure of the exact figure, as the fire department keeps no official record. The most recent snake he captured was a python hiding in a bathroom. Most common snakes found in Jakarta homes are not dangerous, however, Hamidi said that if large enough, a python can swallow a person and cobras are venomous. One particularly horrific video showing a body being taken out of a snake went viral on the internet in March last year. The Jakarta Post said the 25-year-old man had gone missing after setting off to harvest palm oil in a remote village in Sulawesi, an island more than 2,000 kilometers to the northeast of Java, where Jakarta is located. A cobra can spit venom that has the capacity to hurt smaller animals including household pets. For humans, cobras are usually only dangerous if the snake bites and the wound is left untreated for a long period of time without receiving anti-venom. Rachmat explained snakes are generally afraid of people. To prevent them from entering houses, Rachmat said the surrounding area must first be clean. He advises Jakartans to avoid piling up things that can be seen as a hiding spot for a snake. "When their prey is gone, they will avoid the area. They only come to feed, if the food is gone they won't go to a place where there are many people," he said. But in the case that someone finds a snake in their vicinity, Hamidi encourages people to stay calm. "Don't panic. When you panic and move a lot, they may attack if they become scared," he said.